These are Foot Saver Shoes from a February 1929 ad in Delineator. Foot Saver Shoes emphasized comfort over high fashion, but these shoes are also chic; the dressy shoe on the bottom has a delicate strap and gracefully curved heel. Nineteen thirties’ shoes from the same company look “clunky” to me. Their thick heels drop straight from the arch to the ground, and the shoe covers much more of the foot. These dressy shoes (one of them trimmed with sequins) are also Foot Saver Shoes, from an ad in Woman’s Home Companion, October 1936. To me, they look thick and chunky, with high vamps guaranteed to make a woman’s legs look shorter and thick ankles look thicker. I see a big difference between the fashionable shoes of 1929 — most of which seem graceful and beautiful to me — and the chunkier, more covered-up shoes of 1936. Styles from an ad for Dorothy Dodd Shoes, Delineator, March 1929. How delicate they seem. In March 1929, Delineator ran a fashion article (by Lucile Babcock) on Spring shoes, which featured these six shoes, from different manufacturers. The following quotations come from Babcock’s article. Black patent leather pump from Laird-Schober. Delineator editorial on Spring Shoes, March 1929. For clocked stockings, click here. Foot Saver walking pump in brown lizard and calfskin. Delineator, March 1929. A Queen Quality pump decorated with “sunburn beige” lizard. Delineator, March 1929. This natural linen [spectator] sport shoe has an embroidered toe and delicate leather trim. Delineator, March 1929. A slate blue kid afternoon pump by J. & T. Cousins. Delineator, March 1929. This “Frosted calf” pump by Garside is silvery gray, with an enameled [Art Deco] buckle. Delineator, March 1929. Shoes and stockings are coordinated to the clothing in this Arch Preserver shoe ad, June 1929. Stocking colors in this ad from October 1929 could match your gown, your shoes, or your skin tone. By 1936, stocking colors were more natural, but still coordinated with shoes and/or clothes. Arch Preserver shoes from April 1929. Delineator. Foot Preserver shoe ad, March 1929. Delineator. The lace-up shoe on the bottom is similar to the “old lady shoes” of the 1930’s, shoes my grandmother still wore in the 1950’s. The Foot Saver shoe at the top of the ad has a thick strap, but it’s trimmed with a fancy buckle and has a graceful curve on both sides of the heel. March 1929. Arch Preserver shoe ad, Delineator, March 1929. Notice the high-vamped, Thirties-ish shoes worn by the model at left. These shoes foreshadow the higher, chunkier shoes of the 1930’s, but the 1929 sport shoe (below at top left) still has thin, graceful trim. Arch Preserver shoes ad, March 1929. Speaking of sport shoes, this nineteen twenties’ ad for ZIP depilatory shows them worn with socks. Sporty spectator shoes worn with diamond-patterned socks in a Zip depilatory ad, 1929. Ad for Walk-Over Sandals shoes, December 1934. Delineator. This ad for Rhythm Step shoes shows a delicate strapped shoe (top left) in 1936. Woman’s Home Companion. But the lace-up shoe in the same ad was more in line with mainstream fashion by then, with a high heel and high vamp covering most of the foot. But fashion is a tyrant. Did they look old-fashioned to the eyes of 1936? Queen Quality Shoes from April 1936, WHC. Queen Quality shoe ad from 1928. There was a big difference between sport shoes and dress shoes, but there’s also a big difference between these 1920’s shoes and 1930’s shoes from the same company. Different heel, different vamp on two lace-up shoes from Queen Quality, 1936. Three generations, 1937. Can you tell which are the young woman’s shoes and which are her grandmother’s? Pattern illustration, WHC. Three generations of fashionable women, 1937. Were you able to match the shoes to their ages? My favorite series of ads for stockings came from the McCullum Company in 1927. 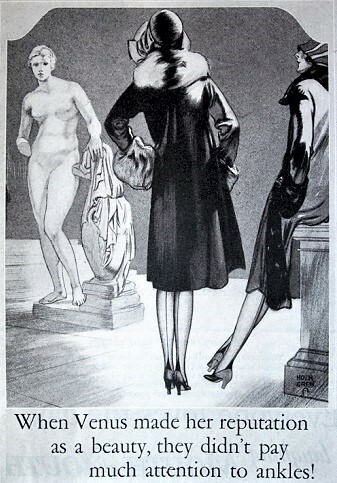 Illustration for McCullum silk stockings for everyday wear, Delineator, April 1927. Text of McCullum Hosiery ad, April 1927. Extra-long silk stockings to wear with a bathing suit, August 1927. Ad for McCullum’s hosiery, Delineator magazine. Note her bathing shoes and the seams up the back of the stockings. Text of McCullum ad for hosiery to wear while swimming. August 1927. 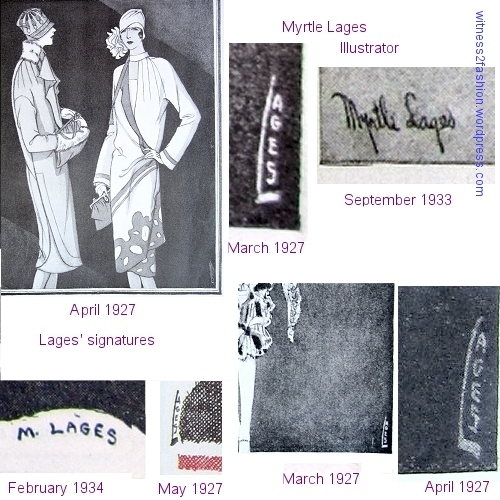 “In the water, or just out, silk hose have the smooth gloss of a wet seal.” Stockings were usually worn with bathing suits in the nineteen teens and early twenties. This 1917 ad for Luxite soap shows long stockings worn with a bathing suit. A bathing suit illustration from 1924 shows both swimmers wearing rolled stockings. Delineator, July 1917, p. 34. However, in this photo from the late twenties, you can clearly see the marks left by my mother’s rolled stockings. Late 1920’s swim suit; you can see the marks left on her legs by rolled stockings, which she had removed. She took them off when she put on her bathing suit. That McCullum “opera length” ad from 1927 seems to be trying to revive a disappearing custom. Playing footsie? A couple dressed for a big date plays footsie in this McCallum hosiery ad. Notice how tense the man is, balancing a corsage box on his knees, and how relaxed the woman is as she stretches out her long legs to brush his ankle. December 1927. Each ad had a border to match — waves for swimming, music for dancing…. I do not know the illustrator — only that these eye-catching drawings are signed H on their left side and M on the right side. The Onyx Hosiery company also used humor to sell stockings, but the illustrations in this series which referred to classical statues lacked the Art Deco dash of the McCallum ads. The stature of the goddess Diana is implied to have thick ankles in this ad for Onyx Hosiery. Onyx ad, November 1926, Delineator. Onyx Pointex stockings had a pointed heel which, their ads claimed, made ankles look slender. Venus had thick ankles compared to women who wore Onyx stockings. Onyx ad, March 1927. That dark triangle at the heel was advertised as slenderizing. Onyx stockings, with their pointed heel, were supposed to make wearers’ ankles look thinner. (The darker heel area showed above the shoe.) Onyx ad, December 1926. Other stocking ads illustrated the product itself — with elegance, but not many laughs. The heels of Gordon stockings came in many shapes; left, a V-shape; right, a rectangle. Gordon Hosiery ad, Dec. 1928. Delineator. As skirts got shorter, stockings got sheerer and more elaborate. Ad for Gordon Hosiery to wear to the racetrack, September 1928. Delineator. The stockings at left have clocks (a vertical design,) which remained a feature of dressy men’s hose for decades. 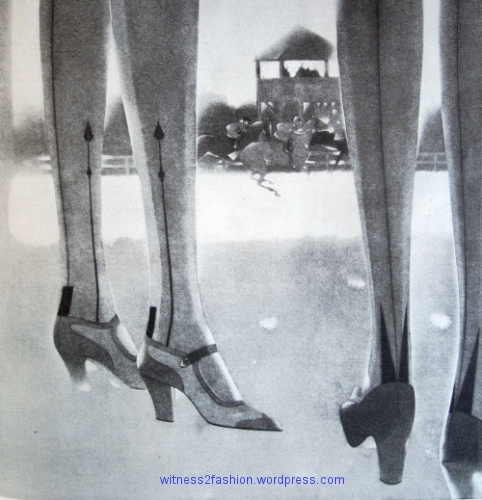 Gordon Hosiery ad, May, 1928. Delineator. A different clock pattern. Gordon hosiery with V-shaped or rectangular heels. Gordon ad, Delineator, October 1928. In the background, a stylized airplane takes off. Anther stocking company just used celebrity endorsements. The extraordinary dress in this ad is worn by Mary Astor, best known nowadays for her role in The Maltese Falcon. In the 1920’s, she made five or six films a year. Actress Mary Astor in an ad for Allen-A hosiery. April 1928, Delineator. A wonderfully stylized illustration of short skirts and stockings under the bridge table. Ad for McCallum silk stockings, Delineator, March 1927. “A length of flawless silk stockings to above the knee . . meets the brevity in skirts.” McCallum hosiery ad, March 1927. “Full-fashioned” means the stockings were shaped like a leg, instead of like a tube. Full-fashioned stockings cost more, but before stretch knit fabrics, stockings that were not full-fashioned tended to wrinkle at the ankles. Like McCallum stockings, the other silk stockings in these ads cost two dollars a pair, more or less, a luxury item for the twenties’ working woman. Prices from an ad for Onyx Pointex stockings, Dec. 1926. Cotton lisle was longer wearing than silk, so it was often used at toes and heels and the band where the garter attached to the stocking. Less practical and more fragile, all-silk stockings cost more. Prices from ad for Allen-A hosiery, April 1928. I’ve never been pregnant, so I have no experience with wearing maternity clothes. However, a few weeks ago I was trying to learn to use the ProQuest search engine (courtesy of my public library.) Under “Fashion,” I typed in “maternity.” I now have quite a collection of articles giving maternity fashion advice from the 1920’s and 1930’s — and haven’t even begun to explore the decades before and after. The emphasis on “concealment” is striking. “Designed to conceal condition and to provide for expansion. “Ad for Lane Bryant Maternity catalog, Good Housekeeping, May, 1931. “Clothes that are designed solely for maternity wear are apt to look the part, and call attention to a woman’s condition. At this time you do not want to be conspicuous in any way. You want to look as much like other women as possible so there will be nothing to draw notice to you. It is much better to choose current styles that can be adapted to maternity wear and use them in preference to special maternity clothes.” — The New Dressmaker, circa 1921, from Butterick Publishing Company via Hearth. “Dresses and Corsets in latest modes, designed to conceal condition.” Ad for Lane Bryant Maternity catalog, Good Housekeeping, May 1930. “Maternity apparel with no maternity look… conceals condition.” Ad for Lane Bryant maternity catalog, Good Housekeeping, January 1932. Of course, clothes that could also be worn after the baby was born were a good thing for the budget. In an era when paying and receiving “calls” occupied a good portion of a lady’s week, receiving callers — in a tasteful tea-gown — meant that the mother-to-be was not completely cut off from social activity; friends came to her. 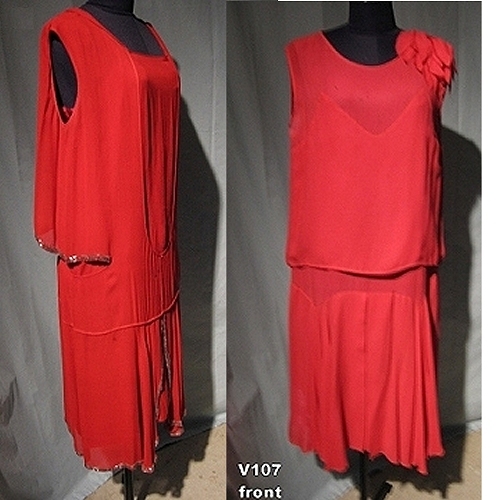 Elegant tea-gowns or dinner-gowns were still prescribed in the 1920’s and 1930s. 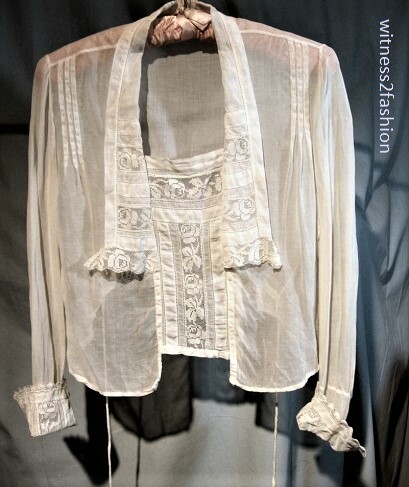 By sheer serendipity, you can read about tea-gowns from 1915 at American Age Fashion. 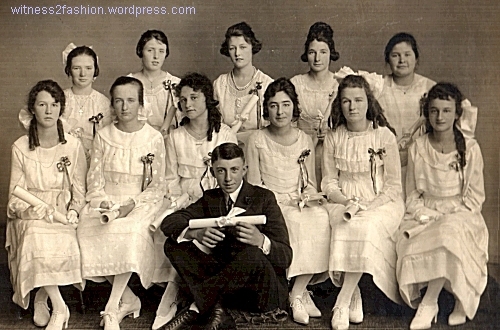 But what about daytime maternity dresses in the nineteen twenties? That tubular style, the distinctive low waist-line — often accented by a snug horizontal belt or band — how did that work with a baby aboard? Vogue patterns 9462, 9457, and 9463. July, 1928. One is a maternity dress pattern. 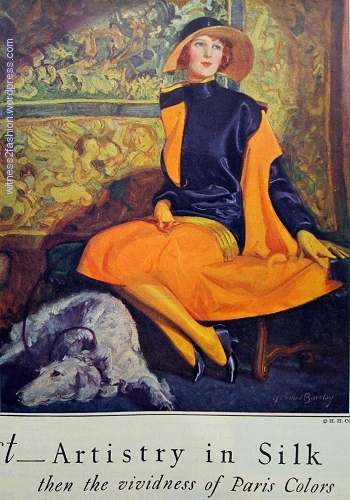 Vogue, July 1928, page 75. Frock 9463, on the right, is a maternity pattern for sizes 14 to 46. [Sizes 14, 16, 18 and 20 were for teens and small women. 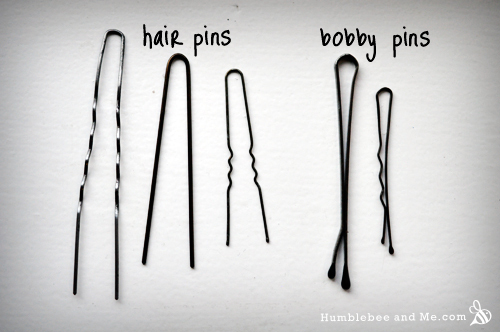 Average sizes were sold by bust measure, e.g., 46 inches.] The dress in the middle is for teens to age/size 17. At least No. 9463 has a hem that dips in front — which would become level as the abdomen grew. It does not appear to have a pleat or seam in back which could be let out for increasing girth. Perhaps the entire bulge was supposed to go above the low belt. No. 9463 was also recommended for “the large woman,” as if a pregnant woman’s weight gain was distributed equally all over her body. Earlier in the 1920s, Good Housekeeping offered a pattern for this maternity dress in an article about its construction. Oddly, the pleated panels seem to be decorative, rather than a means of expansion. A maternity pattern from Good Housekeeping, August 1923. Adding about three inches to the top of the center front of the skirt in a curve which tapers to nothing at the sides is actually a clever idea (if you don’t mind taking the dress apart at the waist seam every few weeks) since it adds length at the waist in front, keeping the hem even and untouched. The girdle [sash] “should fold over at the hips, not tie. The ends should come well down the length of the skirt.” “Have strips for panels hemstitched and then plaited — fine knife plaiting which can be done by any of the small shops or by a department store. Be sure to caution the worker” that the pleats in the two panels should not all run in the same direction, but folding toward or away from each other. 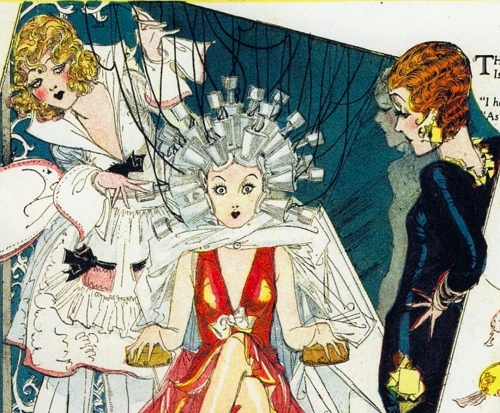 — Laura I. Baldt, “How to Make a Smart Maternity Frock” in Good Housekeeping, August 1923. In July of 1926 Professor Baldt recommended this maternity pattern, also available from Good Housekeeping. These made-to-order “Practical maternity clothes” could be ordered from Good Housekeeping Shopping Service in 1925. Practical maternity dresses from Good Housekeeping, February 1925, p. 62. “Maternity girdle with front and back lacings is of pink satin, $10. Back-lace maternity corset of brocade damask, $10. Brassiere $3.50. 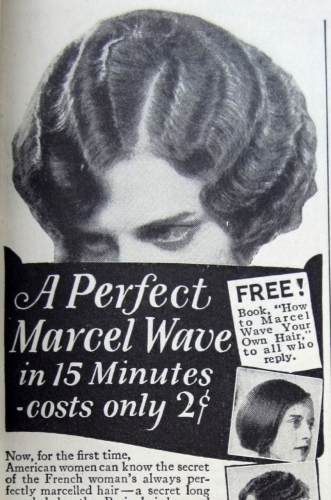 Good Housekeeping, Feb. 1925, p. 62. Side views of maternity brassiere, girdle, and corset. Good Housekeeping, Feb. 1925. Lane Bryant maternity corset ad, Vogue, Nov. 15, 1925, p. 159.